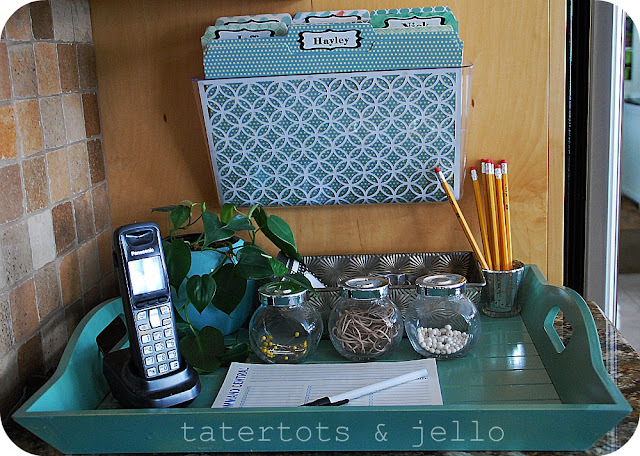 Today's organizing know how comes from Jen of the ever fabulous Tatertots and Jello. Jen's blog is one of my favorite spots since its loaded with fun, whimsical projects you can use all over the house.  Even looking at her blog header makes me smile. And its no surprise she takes organizes with a bit of fun as well. Take a look. 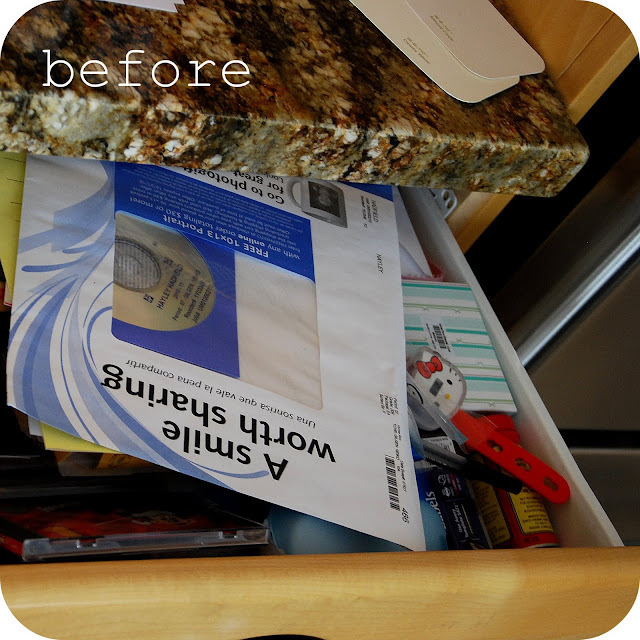 Hi I was so excited when Stefanie contacted me about possibly sharing a junk drawer transformation on her blog. 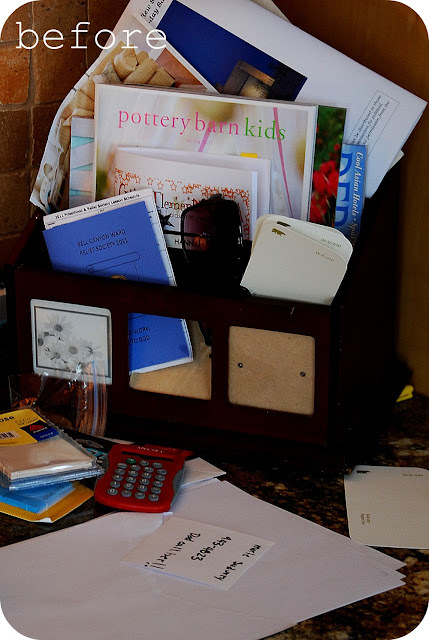 I have a little corner in my kitchen that I originally set up to hold all of the kids' important school papers, directories, plus paper and pens for taking messages. Unfortunately that area became a dumping ground for all sorts of things -- catalogs, papers and odds and ends. And that area became so messy that phone messages would sometimes get lost! I decided I needed a simpler way of keeping track of papers and messages. 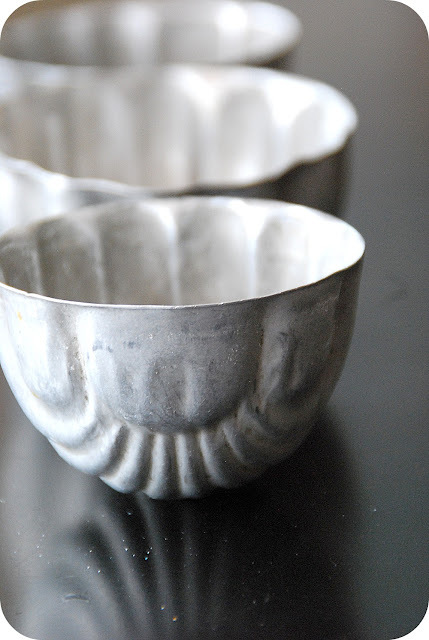 The transformation started off with some vintage bread pans and jello molds I discovered at a thrift store. 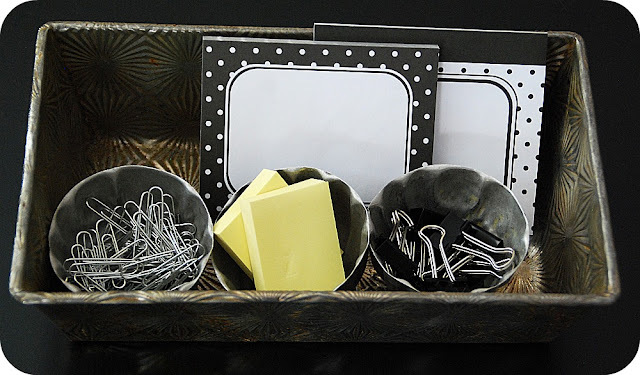 I used the jello molds to hold small items like tiny post-it notes, paper clips and clips. Then I found a clear file folder holder at Target ($2.99) that could be hung on the wall -- freeing up valuable counter space. 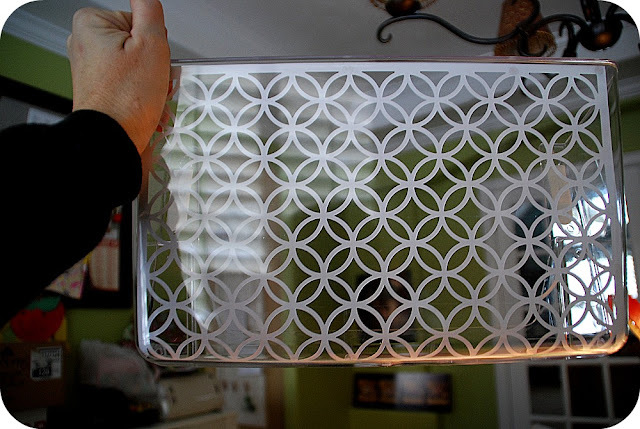 I had some Martha Stewart laser-cut paper with a quatrefoil design. 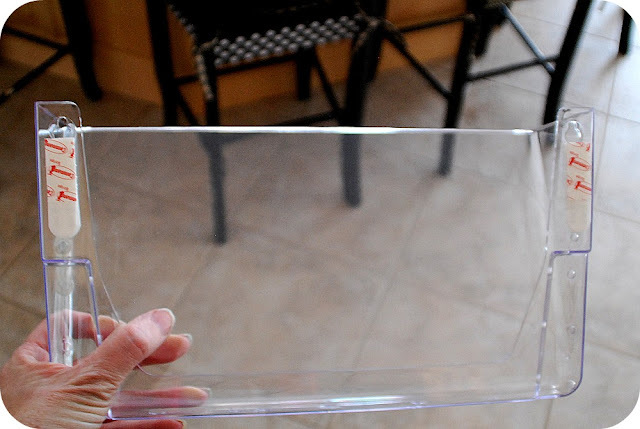 I attached a sheet of it to the inside of the clear file folder rack. 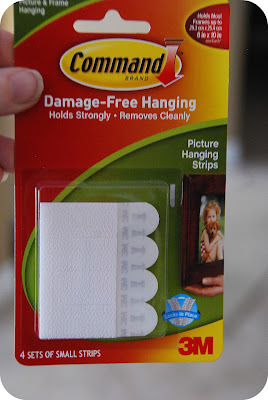 I used some 3M Command strips to hang it so I wouldn't have to put any holes in my wall. I like these strips because when I want to remove them someday, they're easy to just pull them off and they won't damage the paint or finish. 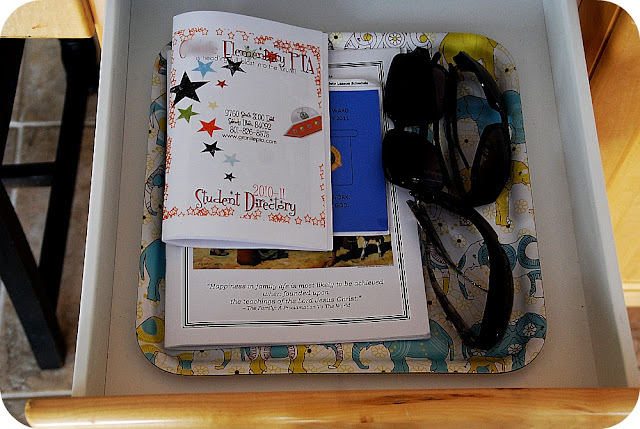 Once I cleaned out the drawers, I put an Ikea tray in each drawer to corral the directories and other items that might slide around by themselves. 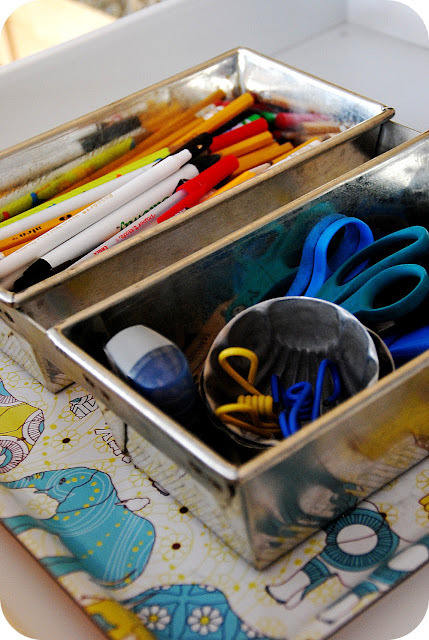 I used a couple of the vintage bread pans to hold extra pens, pencils, scissors and other items that are used in the desk area. I made a file folder for each person in the family to keep their current papers like permission slips, current homework and things that people need right away. I let everyone pick our a paper that they liked for their file folder. Then I traced the file folder onto the paper and cut it out. 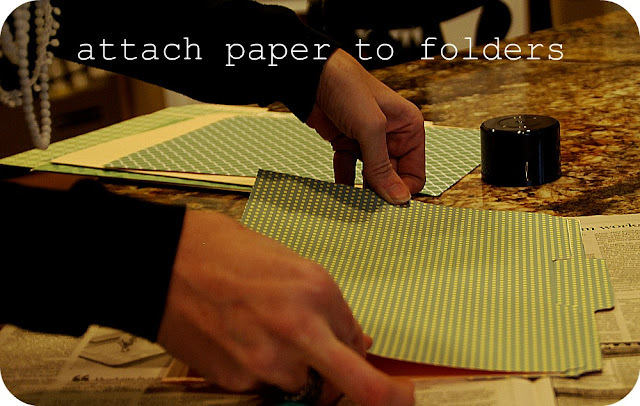 And used spray adhesive to attach the paper to the file folder. To finish the file folders, I printed out each person's name using printer labels. 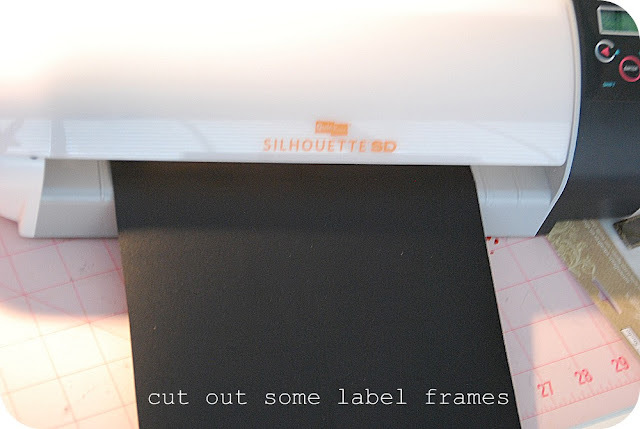 And then I used my Silhouette machine to print out some label frames that I put on top of the labels. Now I have a place to put everyone's school papers and other important to-do papers. The last thing I did was brought a tray in to hold all of the desk materials. I'm so happy with my new message station. I feel like I can find everything so much easier. It's a great way to start off a new year!! To see more of Jen's fabulous projects, stop over at Tatertots and Jello. 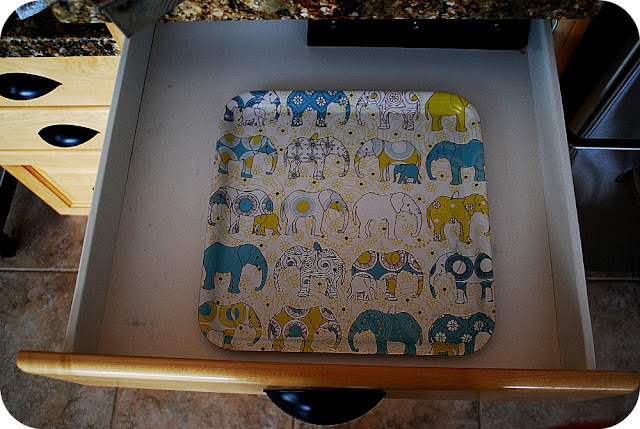 I L-O-V-E that elephant tray! What a happy surprise each time you open the drawer. Nicely done. This is a "must" at my house. This looks great! love the file folder covers. That is the prettiest "junk area" I've ever seen! 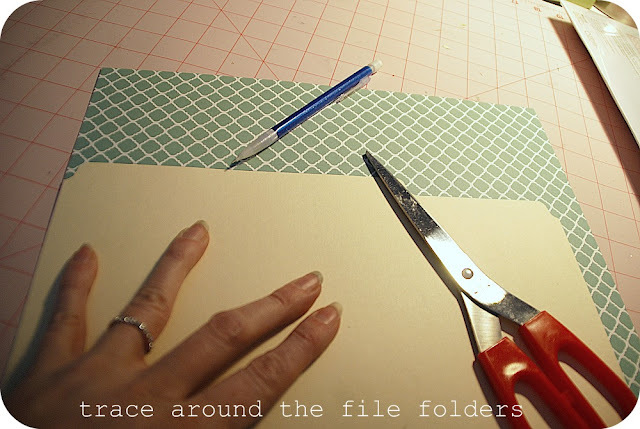 I really love the hanging file and how she used fun paper to dress it up! So pretty! 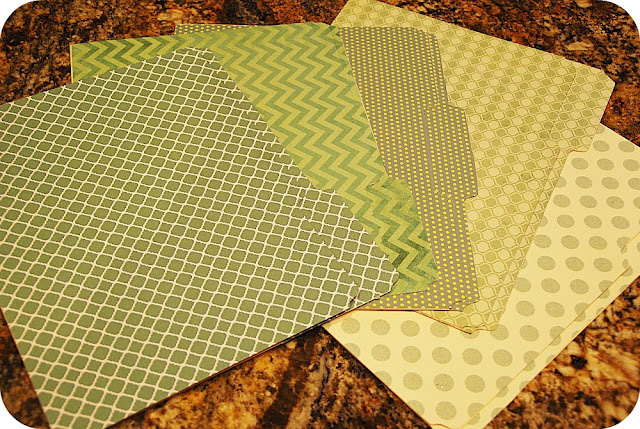 I love the abundance of DIY because fancy folders etc., can be so darn pricey. Thanks for this awesome before & after. My favorite so far! And I love the teal tray. 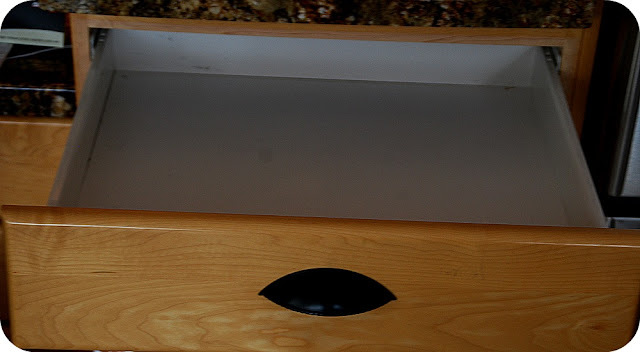 i just bought a similar sized tray from a thrift store last weekend. Of course, mine is covered with funky handpainted flowers and stripes but now I know exactly what color I'll be painting it this weekend! LOVE THIS!!! 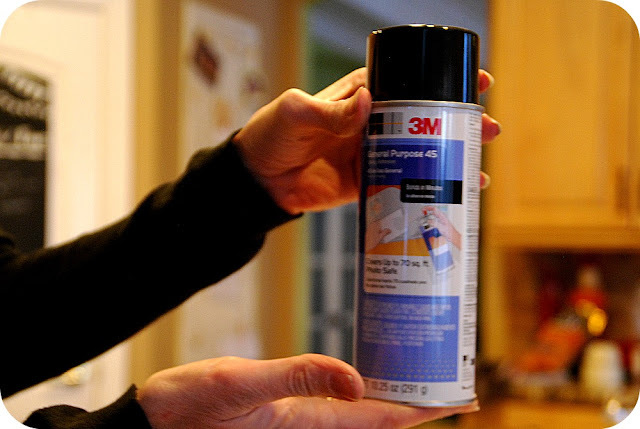 I am doing this project this weekend!!! Thanks! I'm sold. I love "command central." This looks wonderful! I just wish I had space in my kitchen for something like this. And I'm in LOVE with that elephant plate! The wall file is fantastic! 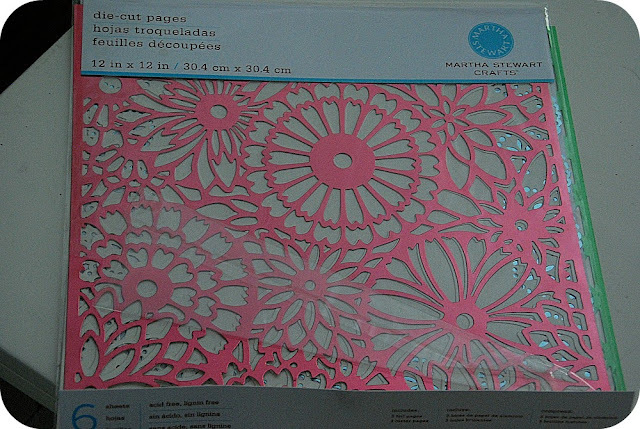 I can't think of a better idea than affixing the die cut paper to make it look less industrial. 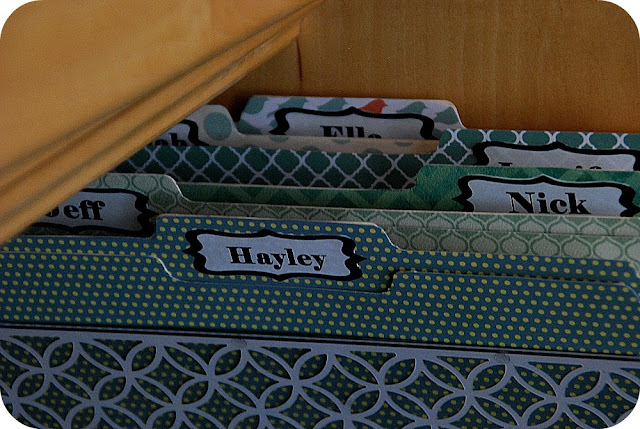 Rather than making my own file folders I think I would pick some up at Tuesday Morning or TJ Maxx. This is very inspiring! 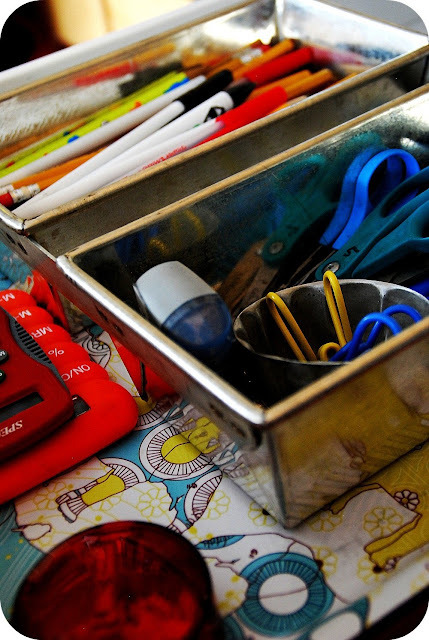 Stefanie, I posted my own "Junk Drawer Overhaul" today! Not only is the organization cool, but the colors you chose are amazing! Yay for greens and whites! I really love this one! I like how she used all different stuff, but it still looks pulled together and functional. Great inspiration! 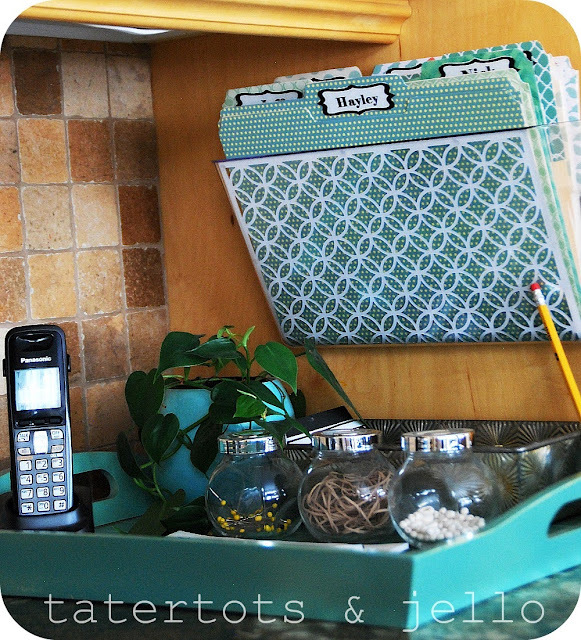 Love those little jello molds and the folders look great, I might give some a try! My favorite part has to be the cute file folders. Very cute! I loved those elephant plates/trays! Me likey!!! I have the exact same small nook in my kitchen that gets cluttered. I think I may borrow your fantabulous idea!! Oh the bread pans are ingenious! I swear I was cleaning out my baking drawer and thought I have zero use for these. But aha, I do now. Thanks for the inspiration!! I love this! I immediately went and set up my own for free, since I already had the file holder and files. I have a question though....are you really cutting that cardstock without the cutting mat or did you just set it up like that for the photo? I would be thrilled if I knew it was safe to cut without the mat! I have a spot just like this in my kitchen! I am going to try this! 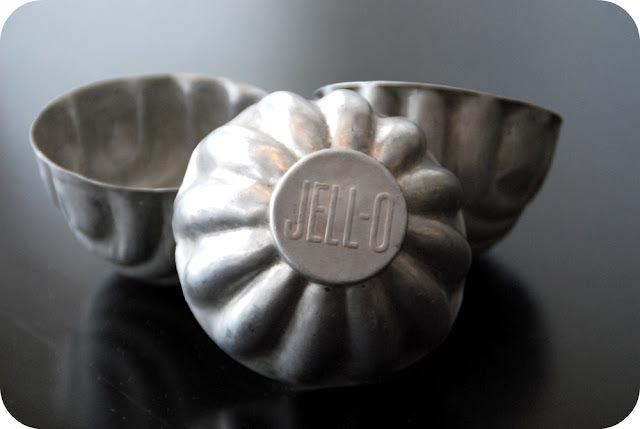 I have some jello molds too that I've been hanging onto for something - and this would be a great use for them! 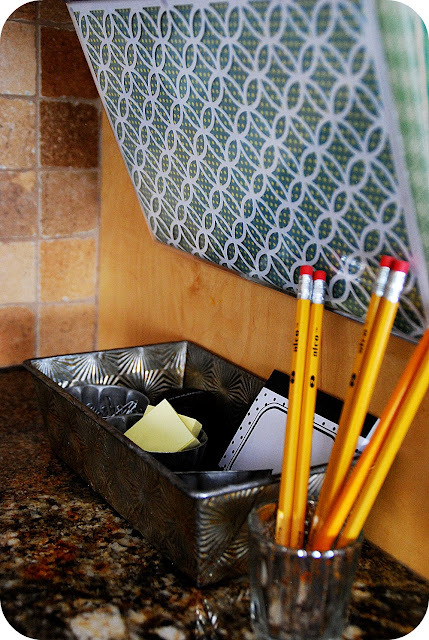 Okay, that is one smart idea for covering basic manila folders! 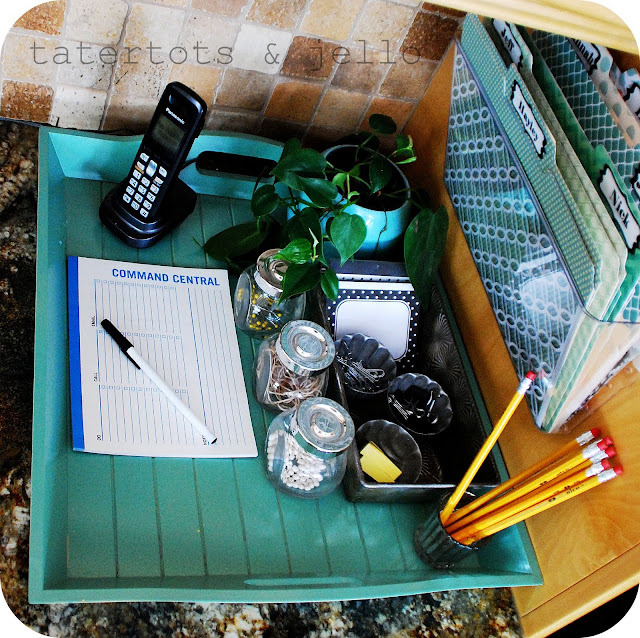 Also love the pretty containers/trays/etc you found to corral everything. Dresses the space right up.